Connecticut may be the richest state in the country, on a per capita basis, but it's racked up a sizable debt worth more than $53 billion – and it could be taxpayers who are forced to bail out the Constitution State, according to the former governor of Indiana. “Someone’s going to the barbershop,” Mitch Daniels, a Republican, said during an interview with FOX Business’ Stuart Varney on Thursday. -First, they taxed the billionaires. I was not a billionaire, so I did not protest. -Then the billionaires left, so they taxed the millionaires. I was not a millionaire, so I did not protest. -Then the millionaires left, so they taxed the rich. I was not rich, so I did not protest. -Then the rich left, so they taxed the middle class. I was not middle class, so I did not protest. -And when the middle class left, they came to tax me. And I could not afford to leave. And Connecticut isn’t the only state struggling with a debt crisis: California, Illinois, New Jersey and New York are unable to make pension payments to retired government workers. In Illinois, for instance, vendors wait months to be paid by a government that’s $30 billion in debt, and one whose bonds are just one notch above junk bond status, according to Daniels. New York’s more than $356 billion in debt; New Jersey more than $104 billion; and California more than $428 billion. “They’re just one of a number of states, including some of the biggest states, that are in deep water,” Daniels said. “I think it is irretrievable. Pensions is the core of it. It’s not the only fiscal recklessness that they have practiced, but in some of those cases, the bill are genuinely unpayable.” Most likely, [Governor Daniels] said, the debt will fall on state taxpayers. From a strictly technical viewpoint, this is a pension debt crisis. However, the pension debt is caused by the simple fact that government has a lot of employees. Government needs a lot of employees, in turn, because we ask government to cater to more and more of our needs. Furthermore, the overspending problem is much older than the unsustainable pension debt. Over the past 50 years, approximately, spending with focus on entitlements has grown steadily as share of state budgets. 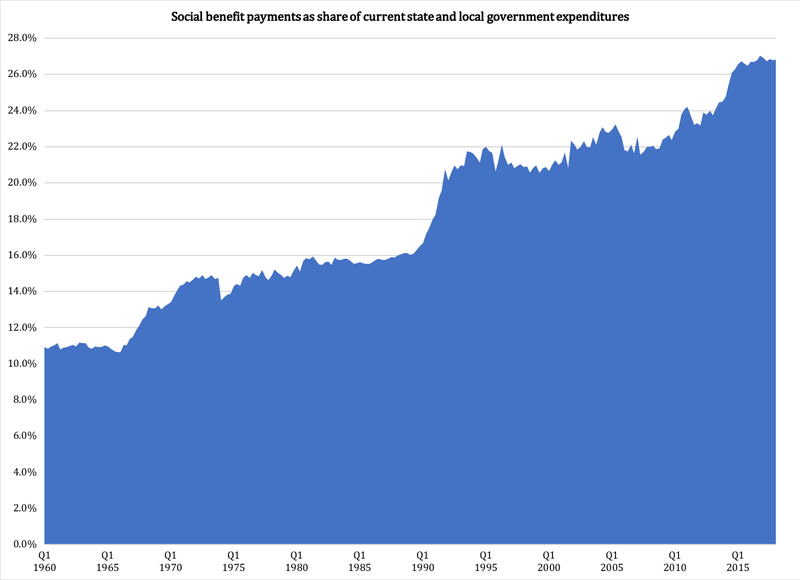 The core of this spending, called "government social benefit payments to persons", has increased from about eleven percent of current state expenditures in the early 1960s to approximately 27 percent today. Adding other entitlement spending, the total welfare-state share of state spending rises to 50 percent. In effect, the welfare state now defines the purpose of state and local government spending. 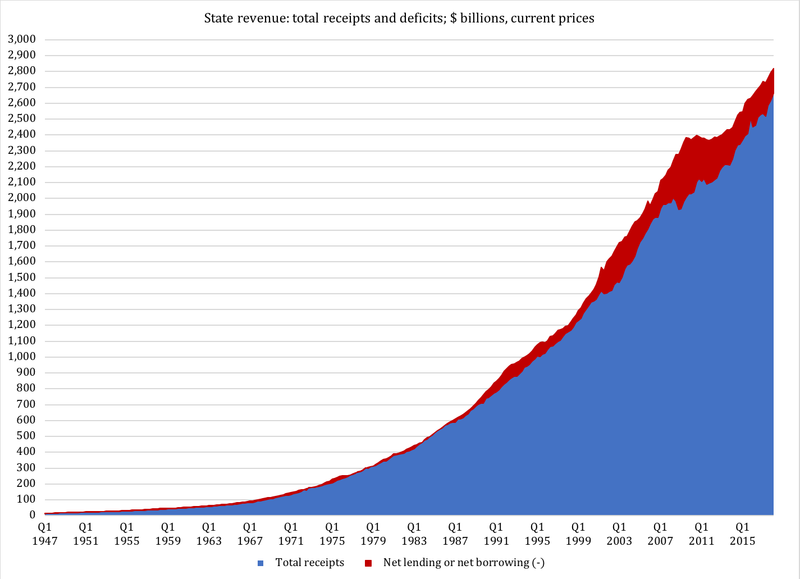 States have always borrowed money, as indicated by the tiny red topping on the blue segment all the way back to 1947. In the 1950s the total deficits of all the states exceeded ten percent of total expenditures almost without exception. In the late '50s borrowed money occasionally paid for more than 15 percent of spending. In 1975 it had reached 10.8 percent. Subsequent tax revolts made it harder for states and local governments to frivolously raise taxes. Most memorable is the property-tax revolt in California that shifted the state from a market-value base for property tax assessments to an acquisition-value base. However, since the tax revolts were never followed by spending reforms, government continued to grow. As a result, deficits started growing again: with the exception of two and a half years around the turn of the millennium, deficits have continuously paid for more than five percent of total state and local government expenditures since 1989. Only significant reforms to roll back the egalitarian welfare state will bring our governments - on all levels - in fiscal balance again. Until that happens, we are at steadily increasing risk of a major, destructive fiscal crisis, just like the one I write about in my "Fiscal Crisis in America" series. Stay tuned for the second installment.